If there's one thing that the likes of Morgan and Campagna have taught us, it's that a three-wheeled roadster can be one heck of a fun ride, bringing together the best elements of a motorbike and a sports car (albeit with none of the practicality). And now they've got a new challenger on their hands in the form of the Slingshot. 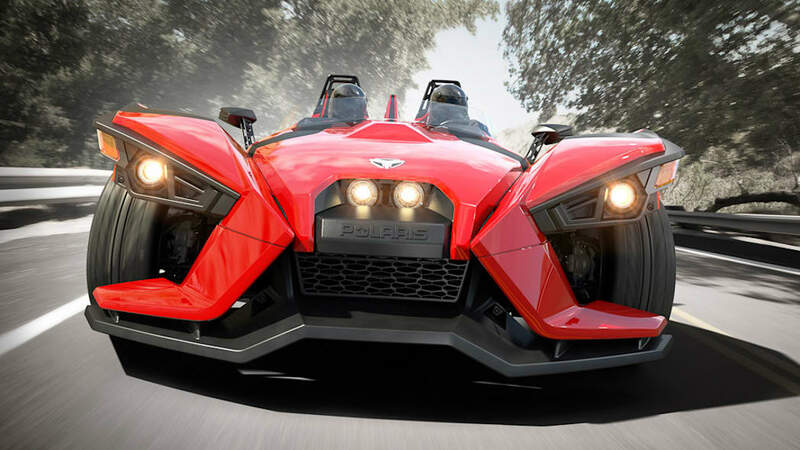 The Polaris Slingshot has been on our radar screen for a few months, but has now been revealed in full. It's similar in form to the Three-Wheeler or T-Rex, but looks more like a KTM X-Bow minus a rear wheel. 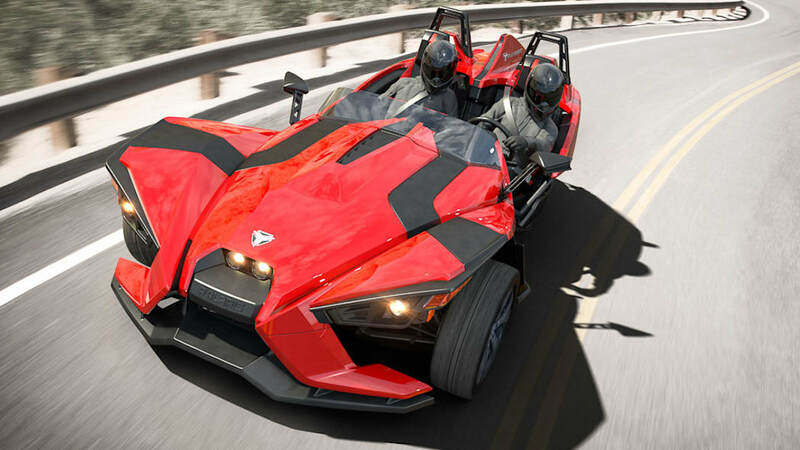 Which may make sense considering that, like the X-Bow, the Slingshot is made by a motorcycle company: Polaris makes snowmobiles and ATVs (as well as Victory and Indian motorcycles). 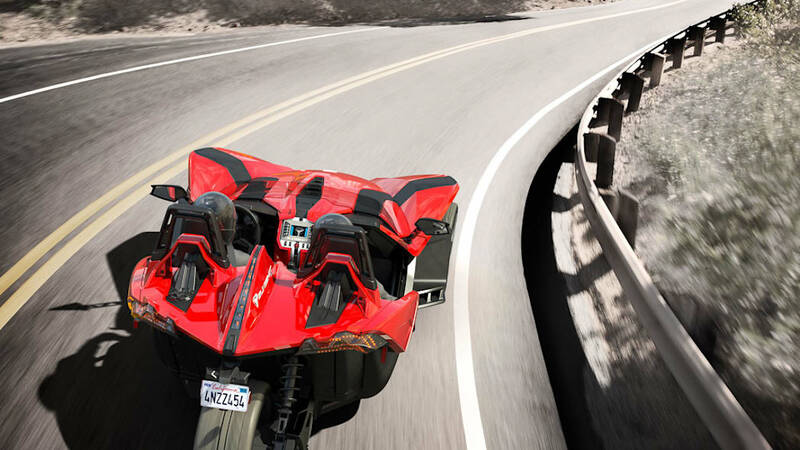 The company is sort of like Bombardier, but where BRP's Can-Am Spyder (with its saddle and handlebars) went with a motorbike approach with an extra wheel, the Polaris Slingshot (though technically deemed a motorcycle for certification purposes) is more like a roadster missing one. The 2.4-liter GM Ecotec four sits up front, channeling 173 horsepower and 166 pound-feet of torque through a five-speed manual transmission and carbon-reinforced drive belt to the solitary rear wheels. In true motorbike-manufacturer style (where pace depends mostly on the rider), Polaris hasn't revealed performance specs. But in a package weighing just 1,700 pounds, it ought to go like spit. Measuring less than 150 inches tall by 77.6 inches wide and 51.9 inches tall, and riding on a 105-inch wheelbase with a 69-inch front track and sitting just 5 inches off the ground, it ought to feel even faster, especially considering that it's got no roof and barely any windshield to speak of. With 11.8-inch vented disc brakes at each of its three corners, it ought to stop on a dime as well. 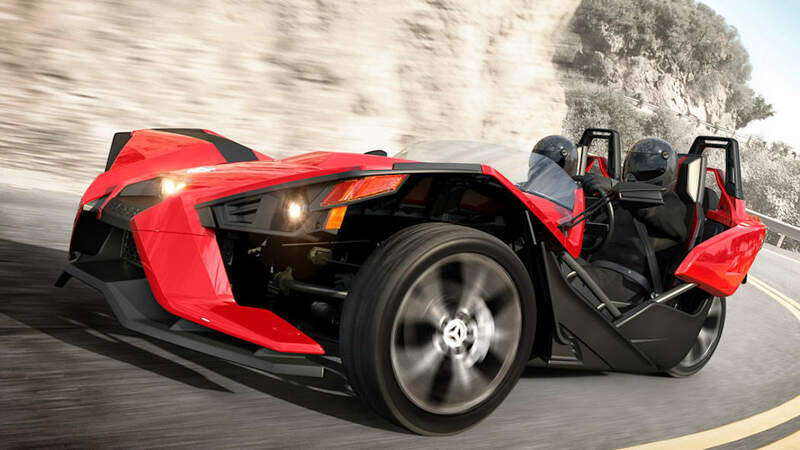 Pricing starts at $19,999 for the base model and $23,999 for the better-equipped Slingshot SL. It comes with a two-year unlimited-mileage warranty extendable up to five years and will be sold by Polaris, Victory and Indian dealers across the country, although the specific laws of its registration (and whether you'll have to wear a helmet when driving it) depend on each state's individual regulations. Check it out on the Polaris website and in the playlist of eleven short video clips below.